SEATTLE (AP) — Through the first few weeks of the regular season, it’s become clear if Washington is going to be successful it must find depth with its scoring. It can’t be Jaylen Nowell and Noah Dickerson all the time. Dominic Green showed Tuesday night the potential to be that complementary scorer. Green hit seven 3-pointers and scored a career-high 25 points, David Crisp added 14 points and Washington cruised past Eastern Washington 83-59 on Tuesday night. Green became the recipient of Washington’s renewed effort not to be stagnant on offense, but to move and share the ball and create opportunities. On this night those open looks came from the perimeter and Green rarely missed. Green was 7 of 10 on 3s, finishing two off the school record of nine 3s set by Ryan Appleby in February 2008 against Oregon State. Green’s previous high was six 3-pointers last season against Bethune-Cookman. The Huskies made 12 of 28 3-pointers. After taking two of three games during the Vancouver Showcase last week, the Huskies (5-2) opened a relatively quiet week with a romp against an in-state opponent. Washington made it look easy thanks largely to its 3-point shooting with Green leading the way. Jesse Hunt led Eastern Washington (1-4) with 15 points, but the Eagles simply did not have answers for Washington’s hot shooting. Hunt has scored in double figures in three straight games. 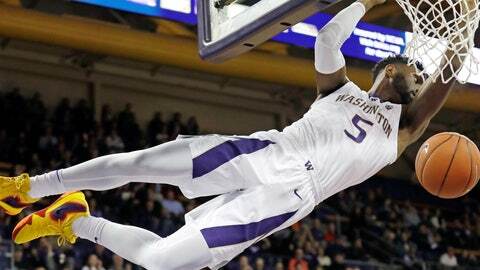 Washington came out of its three games in Vancouver, British Columbia last week in search for more consistent shooting and ultimately a third scorer along with Dickerson and Nowell. Green could be an option if he becomes less streaky with his 3-point shot. Green has shown flashes through his career of being a premier shooter, but it’s been spotty. At times he can’t miss. Other times he can’t hit anything. Tuesday was one of those nights where Green couldn’t really miss. He hit four 3-pointers in the first half and even his misses looked like they could have dropped. Green hit his seventh 3 in transition with 11 minutes left. He had a good look from the corner moments later, but the potential eighth 3-pointer rimmed out. He never took another shot from deep, a couple of times making a pass rather than taking a contested shot. Green checked out for good with just over six minutes remaining. Washington entered the game shooting just 29.5 percent on 3-pointers, ranking 300th of 351 teams nationally. Their 5 ½ made 3s per game was 313th nationally. So making 12 and shooting 43 percent from deep was a vast improvement. “We made them tonight and it’s a different game. It’s a different game when you make shots like that,” Hopkins said. Eastern Washington: The Eagles dropped to 0-3 this season against Power Five schools having previously lost to Syracuse and Oregon. The Eagles have one more game against a Pac-12 opponent when they travel to Stanford on Dec. 15. Washington: The Huskies played the first half without Dickerson, their second-leading scorer, because he was not feeling well. He scored his first basket with 16:50 remaining on the low block and finished with seven points in 11 minutes. … Green’s previous career-high of 20 points came against Western Kentucky in November 2016. … Nowell flirted with a triple-double, finishing with eight points, nine rebounds and seven assists. Eastern Washington: The Eagles will face Seattle on Saturday.